Energy Storage systems are gaining popularity in the Europe due to growing power demand, declining cost of energy storage systems and shift towards more cleaner fuels. Electro-chemical batteries are now mostly used to bridge the power demand and supply gap by storing the renewable energy and managing grid during peak hours instead of using fossil fuels. According to 6Wresearch, Europe Energy Storage Systems market size is projected to grow at a CAGR of 14.5% during 2017-23. However, energy storage systems market is still in its initial phase of deployment in most of the European countries on account of lack of common policy framework across different countries which is creating uncertainties among companies and investors to invest in technologies and R&D. Power utilities is the major revenue generating segment in the overall Europe energy storage systems market share as high initial investments are required for large scale storage systems and also these have better access to energy infrastructure. However, energy storage in residential sector is gaining popularity in the European countries such as Germany, Italy and UK due to government subsidy on installing residential solar plus storage systems, which would spur Europe energy storage systems market forecast period revenues. 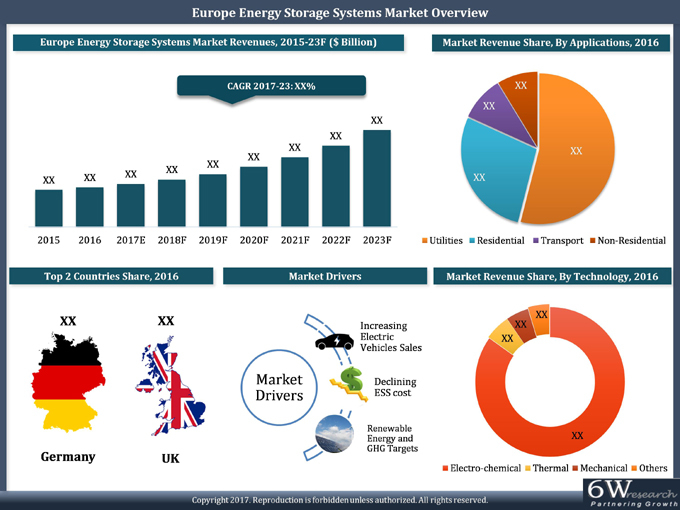 The Europe energy storage systems market report thoroughly covers the market by technologies, applications and countries. The Europe energy storage systems market outlook report provides an unbiased and detailed analysis of the on-going Europe energy storage systems market trends, opportunities/high growth areas, market drivers which would help the stakeholders to device and align their market strategies according to the current and future market dynamics. • Historical Data of Europe Energy Storage Systems Market Revenues for the Period 2015-2016. • Market Size & Forecast of Europe Energy Storage Systems Market Revenues until 2023. • Historical Data of Europe Energy Storage Systems Market Revenues by Technology for the Period 2015-2016. • Market Size & Forecast of Europe Energy Storage Systems Market Revenues by Technology until 2023. • Historical Data of Europe Energy Storage Systems Market Revenues by Application for the Period 2015-2016. • Market Size & Forecast of Europe Energy Storage Systems Market Revenues by Application until 2023. • Historical Data of Europe Energy Storage Systems Market Revenues by Countries for the Period 2015-2016. • Market Size & Forecast of Europe Energy Storage Systems Market Revenues by countries until 2023. • Europe Energy Storage Systems Market Trends and Developments. • Europe Energy Storage Systems Market Overview on Competitive Benchmarking. 17.4 LG Chem Co. Ltd.